The GIGABYTE X470 Aorus Gaming 7 Wi-Fi is a premium offering aimed primarily for gamers with a wide variety of popular features such as RGB backlighting, a large power delivery heatsink, and support for DDR4-3600 right out of the box. 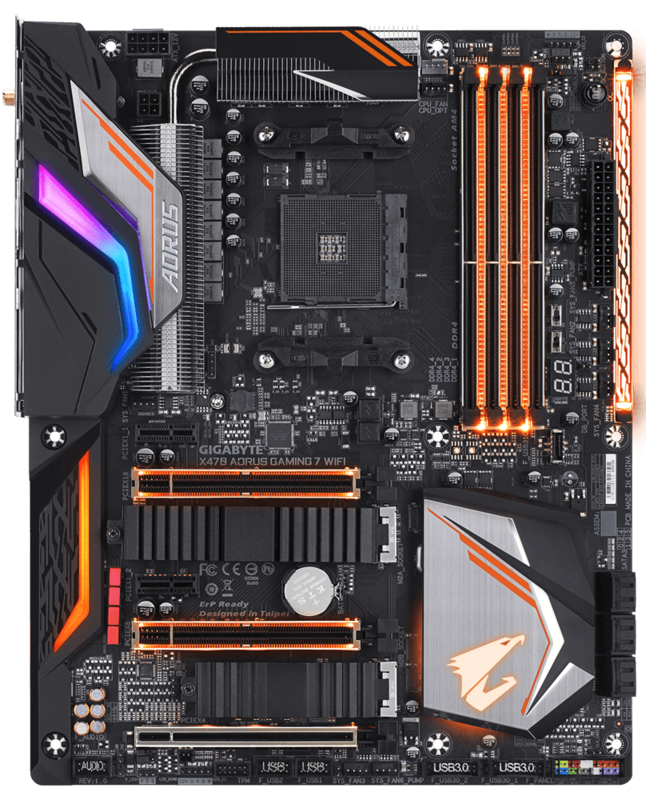 The biggest refinement from GIGABYTE from the X370 line-up is a souped-up power delivery heatsink which one would expect from an older generation X38 motherboard such as the ASUS Maximus Formula SE with its large copper direct heat pipe and large stack aluminum fin array. The new heatsink garnered praise during its unveiling at the GIGABYTE booth at CES 2018 the day before AMD's Tech Day where AMD unveiled their 2018 roadmap. The X470 Gaming 7 currently sits as GIGABYTE's flagship AM4 motherboard and for the price, aims to offer users a premium motherboard, at a reduced cost in comparison to companies such as what ASUS and ASRock charge for their bellwether boards. While not a budget board in any sense of the phrase ($240), the selection of controllers highly the potential upturn in cost for the X470 Gaming 7. The single RJ45 LAN port is powered by a standard Intel I211-AT GbE LAN chip, while the onboard audio features the more up-to-date Realtek ALC1220-VB audio codec; in addition to the codec is a single ESS SABRE 9018 DAC for a more defined range of audio and steps up the game on boards just featuring a single codec. 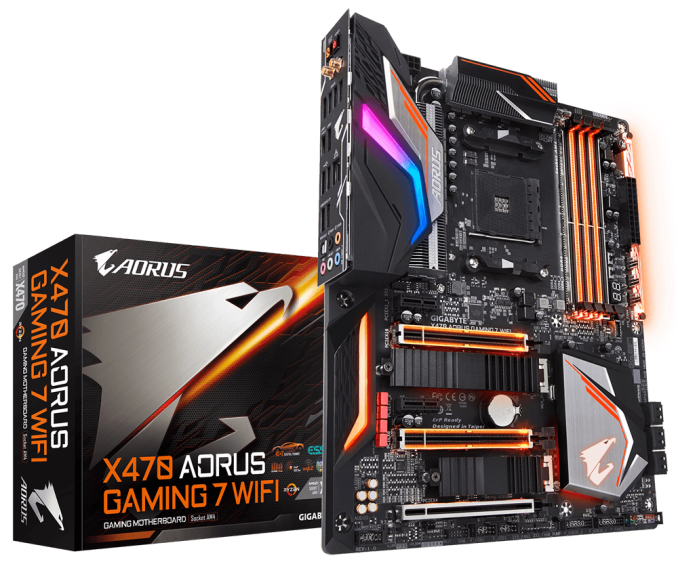 While this latest AM4 variant is dolled up with Bluetooth 5 support, the X470 Gaming 7 sports a built-in 2T2R Wi-Fi due to the integration of Intel's new 9260NGW 802.11ac Wi-Fi module with Wave 2 compatibility for the 11ac and 160 MHz wireless signals; Wave 2 compatible devices offer MU-MIMO capability and offers up to 3x the throughput over 802.11ac Wave 1. The biggest win from the performance of the X470 Gaming 7 Wi-Fi came in Handbrake video conversion test where it consistently performed well and even managed to output the best result in the H.264 HQ test out of all the previous AM4 boards on test. Another positive result came in the POST time where cold booting times of under 16 seconds were attainable. On the other hand, the Gaming 7 Wi-Fi didn't deliver the kind of performance that a premium offering should with the result in Total War: WARHAMMER coming in at over 3 frames on average lower than other products we have tested. 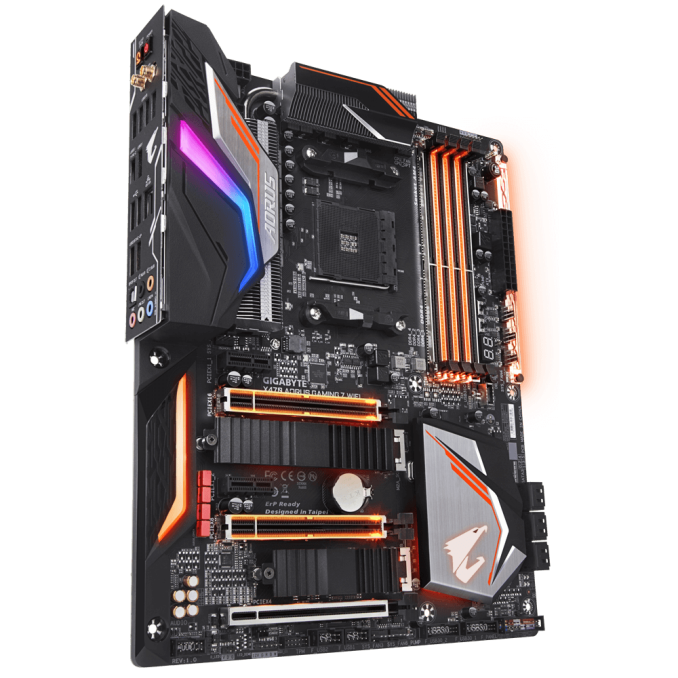 The GIGABYTE X470 Gaming 7 Wi-Fi does stamp its authority on the AM4 market with its old-school styled monolithic power delivery heatsink, uprated (on paper) onboard audio component selection and the inclusion of Intel's newer 9260NGW 802.11ac Wi-Fi Wave 2 capable module. It has everything you would expect from an RGB clad premium offering, perhaps the only neglected area being 10G Ethernet which would of most certainly topped the price up even further than the $240 asking price GIGABYTE has set. The $240 launch pricing also seems rather reasonable all things considered considering the previous flagship AM4 model from GIGABYTE still remains at $210. 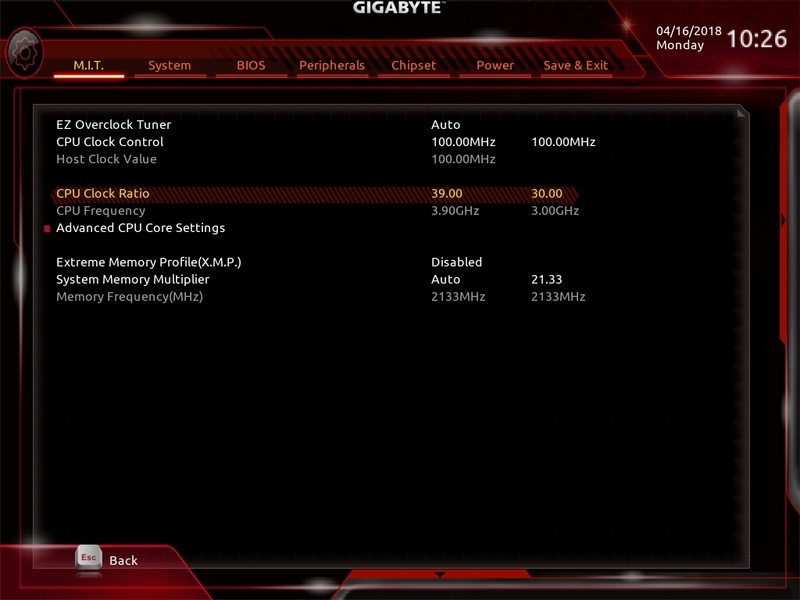 With audio usually being neglected, GIGABYTE is one of the few vendors who care on flagship models and it shows here with the new Gaming 7. With the launch of the new Ryzen 2 processors, it has brought about a refresh of sorts on the AM4 (code name 'Promontory') chipset. The socket is still the same (AM4), with AMD upholding its promise to have a long-lasting socket family. The chipset relative connections such as the six SATA 6 Gbps ports and USB 3.1 Gen 2 are still present from the previous generation X370 chipset. One of the primary benefits to these new motherboards is that they are not just backwards, but also forwards compatible. This means that both the first and second generation Ryzen processors will work, providing the relevant and latest firmware is installed onto the 1st generation AM4 motherboards including A320, B350 & X370. One of the most notable improvements from X470 over X370 comes through the optimization for faster memory. Whereas B350/X370 had a number of memory compatibility problems at launch, which were mostly fixed by a wave of firmware updates, official support was still capped out at DDR4-3200. An improvement has been made this time around with the Zen microarchitecture moving to a new 12nm manufacturing process, but for more, you can check out our Ryzen 2000-series review. Even with the GIGABYTE X470 Gaming 7 Wi-Fi, memory with speeds of up to DDR4-3600 is supported out of the box with Ryzen's 2nd generation processors which do show that AMD has learned from their previous mistakes at launch in working with manufacturers to allay launch issues surrounding memory compatibility. The other major enrichment on the X470 platform isn't exactly new, but the new X470 chipset has support for the new StoreMI software which is essentially a rebrand of the Enmotus Fuzedrive storage acceleration software. Potential uses for this would be to boost already in use mechanical storage through caching, or taking all aspects of storage and memory such as an SSD (NVMe or SATA) and DRAM, and combining them all together into one location. The benefit of this is quicker access to the key and critical files stored, with the software optimizing where things should go. More about StoreMI and how it operates can be found here at this link.